Driftwood Dunes offers all the most sought after attributes of a vacation rental home on Scenic Highway 30A. The location couldn’t be more perfect, settled between Rosemary Beach and Alys Beach within steps of the Seacrest Beach Lagoon Pool! Use your 4 complimentary bikes or walk to nearby shops and restaurants or catch a ride on the Beach Tram to the white sand shores of the Gulf of Mexico. Entering the front door you will find the open living, dining and kitchen, which are perfect for family. A well- equipped kitchen is complete with a large island and breakfast bar, granite counter tops and stainless appliances. There is a half bathroom off the kitchen. The laundry room is complete with a full size washer and dryer and access to a side exit off the house. The first-floor master bedroom with walk-in closet and in-suite bathroom complete the ground floor. The master bathroom has dual vanities and a stand alone glass shower. The master bedroom also has private access to the rear covered porch and driveway. Head up the stairs and you will find two guestrooms, another master bedroom and an office nook on the second floor. The two, rear guestrooms enjoy access to an expansive private balcony. Both guestrooms share a hall bathroom with dual vanities and a shower/tub combo. 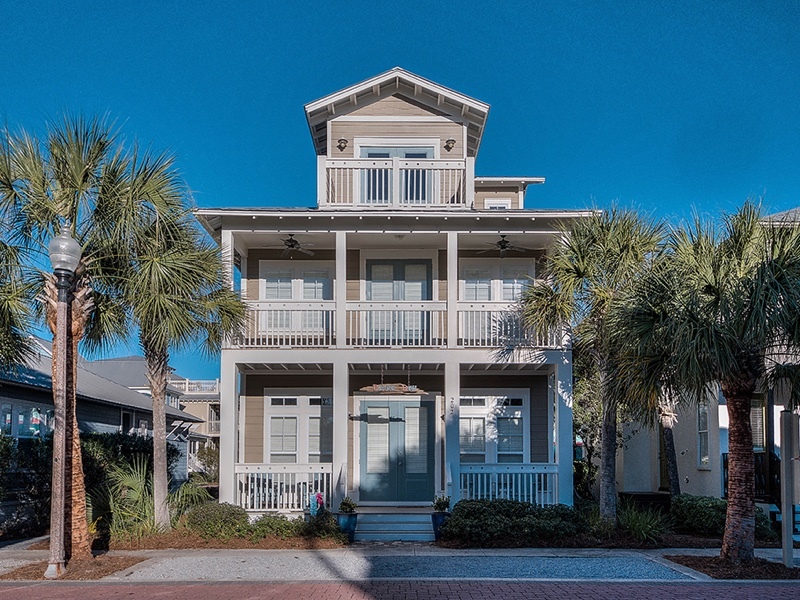 The second-floor master bedroom has private access to the front balcony overlooking Seacrest Beach Blvd. W. The master bathroom has a walk-in closet, dual vanities and a separate jetted tub and shower. Up the stairs to the third floor you will find an additional bedroom area that doubles as a second living room with queen sleeper sofa and full bathroom. Gaze out to the Seacrest Beach rooftops from the third-floor balcony and enjoy listening to the crashing waves and feeling Gulf breezes.